September 24, 2014: At least 22 members of the football team were reported sick, some hospitalized, after the team potluck at the Durand High School in Wisconsin. Lab tests have confirmed suspicions of the pathogen to be Campylobacter Jejuni. Wisconsin Department of Health said that unpasteurized milk served at the dinner was the cause of the outbreak. More than 50 Durand High school students were forced to stay home due symptoms that included Diarrhea, cramps, fever, and stomach pain. The potluck is a yearly tradition at the high school usually held at the nearby school. Dinner included Chicken Alfredo, Kool-Aid, water, and raw milk with chocolate syrup added. The Wisconsin Department of Health (DHS) interviewed all players and coaches of the football team (ill and unwell) in order to assess symptoms, as well as find the root of the problem. Consumption of raw milk appeared to be the isolated as the only food item associated with the illness. Symptoms lasted for about a week and ranged from mild to severe. Other complications include meningitis, urnary tract infection, arthritis, and sometimes, Guillian –Barre syndrome. One of the students, Brianna, reported unusual pain in her hips and knees, limb weakness, as well as numbness for which she was hospitalized. Reportedly, other students were hit hard by the symptoms as well, many suffered from bloody diarrhea and noticeable weight loss. According to the Health Canada website, people infected with C.jejuni can experience an array of symptoms. Some may not get sick at all, but still be able to spread the disease. Others may experience a severe flu, while some may be hospitalized. The outbreak affected the football team so much so that the high school cancelled the Sept 27th football game against Amery High School. 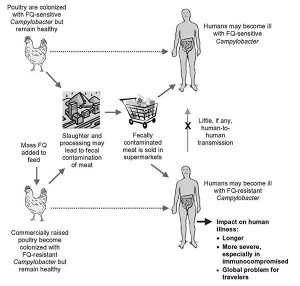 Campylobacter Jejuni, the pathogen identified as the cause of this outbreak, is found in digestive systems of cattle, poultry, and animal feces. The DHS collected samples of manure from the farm where the raw milk was produced, and the bacteria strain was found positively correlating the bacteria to the illeness. People with weakened immune systems are at a greater risk of complication including arthiritis, meningitis etc. The state-law prohibits sale of unpasteurized milk products to the public to contain bacteria that may promote food borne illnesses. Moving forward, the school recommends fewer dinners like potlucks, as the food quality is difficult to control. The effects of this have been particularly eminent to the student population. Nice blog! It’s really sad when you hear stories about school-related events get affected by food-borne illness outbreaks and yet it occurs so frequently. I think its a good idea to ban the sales of unpasteurized milk in secondary schools because it may not be handled/distributed safely because the people in those events may not be aware/or taught how to ensure food safety in those products. In addition, some students may be highly sensitive to unpasteurized milk and these types of issues really reflect on the schools policy.